We have met on Instagram. This is how we should introduce our relationship to the Los Angeles-based collector Alberto Chehebar. Being an active follower of Chehebar’s feed for a number of months, a DM message, followed by a phone call, is how the connection developed, leading to the following interview. 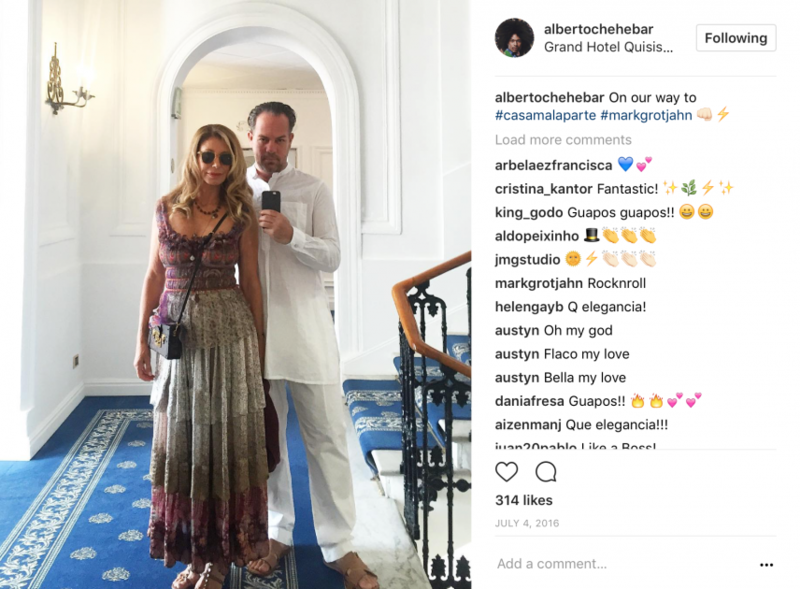 The move from Miami to Los Angeles, how to crop images, and his feelings for a “flying“ Condo post are just a few topics that he shared with Charlotte Olbricht and Christoph Noe. Our first question would usually be: what made you start collecting art? But today we are directly going into depth because of how we actually met: via Instagram. How do you use it? I started using Instagram about five and a half years ago. I always wanted to photograph, and I always liked to photograph spaces that had art in them. I actually think I was one of the first persons that started photographing such spaces and directly putting it on Instagram. The application became my way to express myself. Now I have a really interesting followship of people that enjoy art. I try not to be political: I focus on expressing my mood, my travels, and the beauty of art. I’m subjective with what I’m showing in general, but I try to be very objective with the art I show. So Instagram is reflecting your travels, your feelings, your personal point of view. Does that mean that we, as followers, will be very up to date when we follow you? Or do you schedule some of the photos for the next one or two weeks ahead with a tool? Nothing is planned in my posts. I’m walking around, if I see something that catches my eye, I find the right angle and I take it. I don’t plan what I’m going to put, but I do make sure that I go out and look at art. I did four visits to private collections in the last six days. So I do move around to see what catches my eye. Usually, 95% of what I post is real time. Today I went to see the Jennifer Guidi show and it’s something that I posted instantly. Everything I did this weekend was in real time. Once in a while, when I feel like I haven’t seen enough in a day I might post a “Throwback”. In your feed, we do not only see pictures from the inside of a museum or gallery, but moreover photos from private homes with awesome interior and art collections. As we know, you are a very keen art collector by yourself. 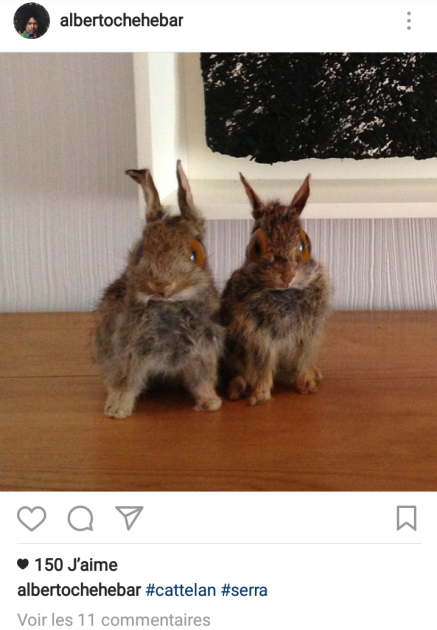 But it is not only your collection what we see, right? Correct. Not everything I post is my own, although I am very open with what I have. If something is hanging where I live, it’s going to end up being on my Instagram in some shape or form. I used to be more timid with what I showed, but I find putting it out there to be really freeing. I try to show the beauty of it in a natural state more than to brag or say, “Here look, I own this.” or, “I have access to that.” It’s deeper than that for me. In this regard, Alberto, we would like to refer to what we are doing. It is quite similar. We are trying to share an insight to many art collections without making it important who owns it and who doesn’t. There are a lot of people, your followers as well as our followers for example, who enjoy seeing it. Not only because those insights usually are private and exclusive, but also because an image like that can give them something to imagine. The images uploaded can cause a feeling of joy. It is just like with these “Instafood” pages, isn’t it? Where we see these amazingly delicious pancakes with the raspberry topping and cream. You can’t have them immediately, but it still gives you amazing feelings. Correct! Instagram gives those of us who aren’t artists a means to express ourselves. What I mean by that is that I always considered myself to have a good eye, and I knew that I was a good photographer myself. 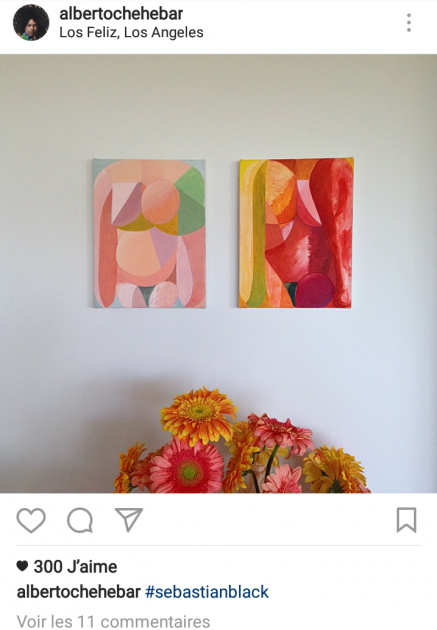 And Instagram has opened many, many doors for me as an art collector as well. I have made extraordinary friends through Instagram, and I talk about art with friends that I’ve never seen their faces. 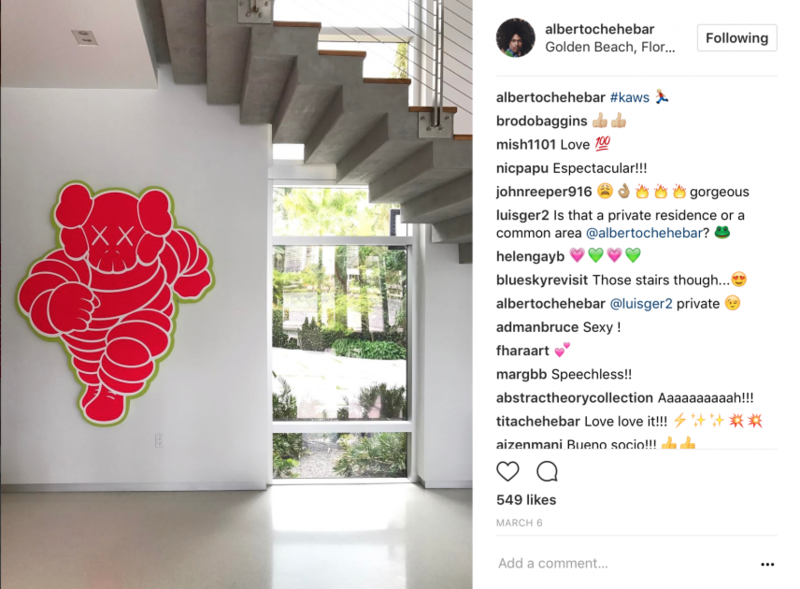 And does it happen that your friends, on Instagram or in person, invite you to take pictures of their private collection: “Hey Alberto, you want to come over? I have a new artwork. Do you want to take a picture and put it on your feed?” Or is it the opposite? How do you deal with their privacy? Well. I’ve been to some collections where, unfortunately, I cannot post. But, usually, artists or collectors like my feed because of the respect I show for the work itself and the way I photograph it. So you are an artist or let’s say a visual curator, who is not only selecting the right photo but is making a selection of what and how you upload it, right? I have found through years of collecting that curating is actually what I truly enjoy. So, yes, there is a curation in the feed that is reflected in the way we hang things in the house. And that the conversation between those pieces translates to how I photograph and how I curate the Instagram. We feel sometimes artworks, in reality, look better than on the picture. 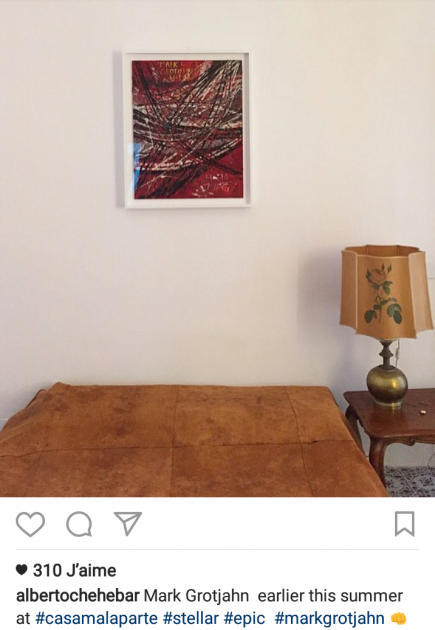 Or the other way around, a little small square insta-photo of an artwork can put it in an even better position by using the right angle or presenting it together with special furniture. That is basically what curating your Instagram feed is about, right? Well, of course sometimes you see collections that have incredible pieces but are badly curated. So, yes, I am good at cropping. If I’m looking at six things and I am very aware that they don’t work together, I’m also very good at saying, “these two with this part of a door is going to look actually quite minimal and well presented.” So, yes, some things look much better when they’re edited. And when I say edited, I don’t mean changing the color or using a filter, it’s another form of curation. What we have experienced is that some of the artists are much more popular on Instagram than others. 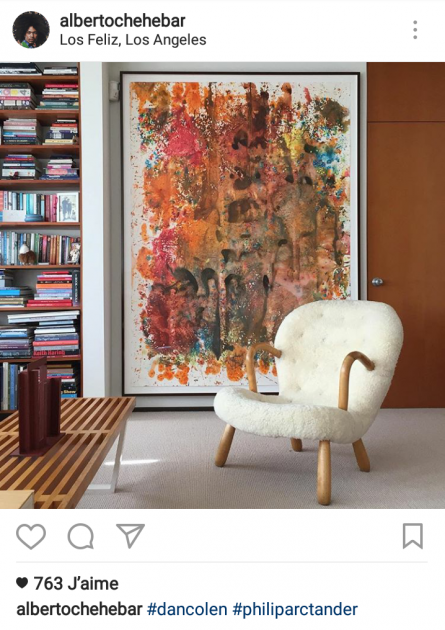 Once you post a Picasso, a Rudolf Stingel or a George Condo, and you tag him or make a hashtag with the artist’s name, more people tend to like it. What artist is most “instagramable” in your opinion? I think George Condo is sure to attract a lot of people, but that wasn’t the case five years ago. Instagram has evolved in that sense. But if I post Condos every day, it will get boring. I look for balance. 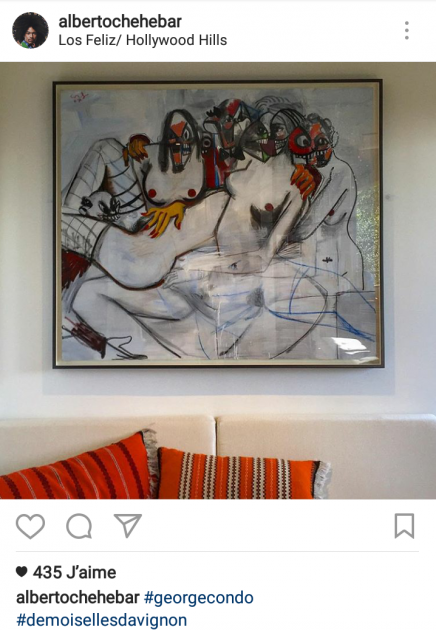 Sometimes I become a little bit delusional with my own ideas, but I like to think that I had something to do with the popularization of George Condo on Instagram. If you go back to my feed, early, early, early in my feed when I had 10 likes, there was a Condo there. I also have a lot of followers simply because I’ve been collecting Kaws for so long. So some of it is the community finds me, and some of it is creating the community. You said you started collecting 27 years ago. Who was the first artist you started to collect, Alberto? Well, I was studying in New York in 1987, so my first exposures to art were the subways, the galleries, the Pop Shop in SoHo. My interest in collecting comes from Haring, Warhol, Basquiat, Lichtenstein. And the first piece I ever bought was when I was 19 years old, and it was Keith Haring’s subway drawing that I still have, and it’s hanging in my house here in LA right now. Fantastic. So you were lucky to see it from these early days. And 30 years later, they are becoming the superstars, and Haring having a full acceptance in the market and Basquiat with all the records. Isn’t it interesting how their perception has changed so much? I mean, if you look at the auction books, there wasn’t a big auction market before 2000. In 1999, you could buy a joke painting by Richard Prince for $8,000, a really good one. You could buy amazing works of Warhol for $100,000. The market started changing and moving in 2000 and going forward. My collecting has gotten better with the years. I want to learn from the people around me, and I have been successful enough to be able to buy work and actually go deeper with artists that I love. 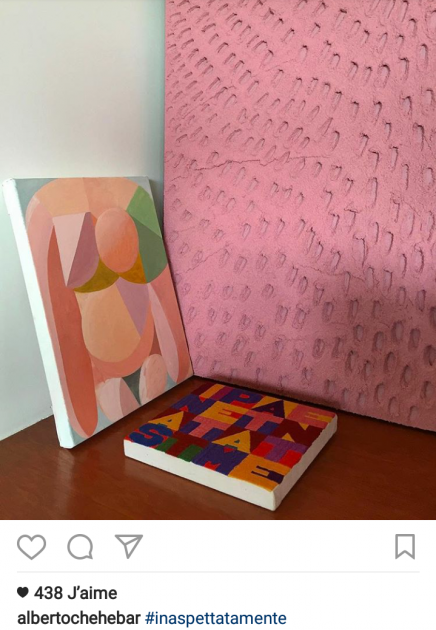 We are aware that people are also using these Instagram galleries and artists as a tool to sell, right? Do you get a lot of dealer inquiries and do also people want to buy the work you took a photo of? Of course. I’m getting DMed more and more every time. I get a lot of inquiries. I get a lot of people calling me. Yes. If somebody wants Kaws, wants George Condo, etc., etc. they reach out to me. So there are possibilities to do deals via Instagram? I’ve done deals through Instagram that I wouldn’t have been able to do walking around a fair. It’s extraordinary how much Instagram has expanded my horizon. And also, more people can see what I do now. Before, I used to walk a fair and showed a lot of interest but nobody knew how I was curating, what my eye was like, what I was buying. And now I can use my Instagram as a presentation card for me. It is almost like my business card. Now, moving a bit away from the digital appearance of your collection. Would you see it as an achievement of you as a collector to show your collection in a private museum? Absolutely. I would love my own space. We’ve been looking here in LA, but we haven’t found what we’re looking for. I mean, again, I do it for the necessity of creating and curating. I don’t want my name on it. I want a big warehouse where I can play around with the artwork. Because when I’m curating, when I’m editing, when I am looking at art, I actually feel peace. So, once again, if we ask you for the motivation, it’s very much as you said for yourself and to share this feeling? Absolutely. There was always this interest of curating, of design. I collect mid-century furniture. So all these things are a necessity for me. So, yes, I would love to have a space and welcome people to come see it. For me, it often is the perfect match having a beautiful lamp from, for example Gae Aulenti or a sofa by Milo Baughman and then having a wonderful Condo complementing it. What would you say is the most important or valuable work in your house which you would save if there was the need to? 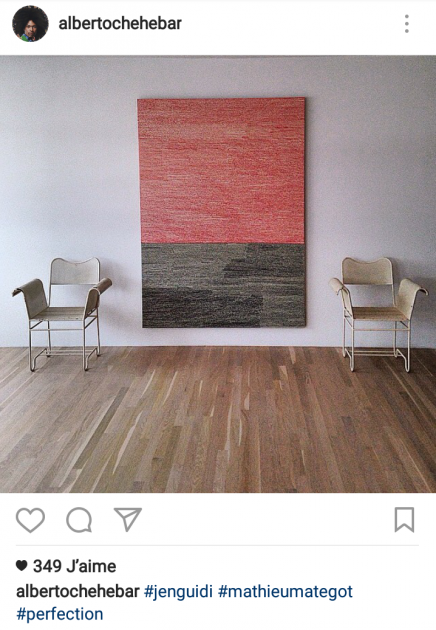 Right now, it’s a beautiful interior by Jonas Wood and a Gio Ponti rocking chair. But I love everything that’s in the house. Let’s switch topics again: Which art fairs are you visiting? Well, until three years ago, I was doing 13 fairs a year, and I got a little bit burnt out by that. I’m trying to be more focused. Miami was my home for 16 years, but LA became the natural place for us to move. It’s is the creative capital of the world right now: in the culinary world, in the arts, in cinema. And I’m not talking about the six or seven amazing artists that are doing really well: I’m talking about really young people that are pushing the envelope and doing big things. The Marciano Foundation just opened. The Broad Museum. Hauser & Wirth. I love what David Kordansky is doing. Instead of going to fairs, I’m doing studio visits. I’m spending more time with artists and gallerists in LA. But I do Frieze. I do FIAC. I do Art Basel. You said you were going to see the young artists studios, which brings us to another question that we had: Are there one, two or three names of artists you are passionate about and that you would share with our readers that are always excited to hear the tips from collectors? Well, there’re a lot. And the problem with saying names is that some people might feel left out. And artists are so sensitive and so, so, so susceptible. There are a few but do you know the work of Orion Martin? Orion Martin? Unfortunately not. Not yet. I went to a studio visit last week of another artist called Andy Woll. Celeste Dupuy-Spencer, I think, has some of the strongest work at the Whitney. I think she’s absolutely extraordinary and going to her studio is a treat. I fell in love with the work instantly. She works really good on paper and she’s doing incredible canvases. But I could tell you 20 names that I like. Calvin Marcus and Aaron Garber-Maikovska are two artists that I find to be amazing as well. I mean, you go to Calvin Marcus’ studio and you could stay there for three hours. And there are so many others. Claire Tabouret. Eve Fowler is an incredible artist and a great eye. Math Bass. The list is long. But I’m not on there trying to create controversy: I’m not telling you which art is good and which art is bad. I’m seeing a few of those on Instagram. I see some dealers and some collectors that get into it. I think art speaks for itself. I try my hardest not to get political or get into fights because we all have different tastes. This is a wonderful finish line, Alberto. From our side, we can only undermine what you said. And to close it out, I really like what you guys are doing. I like that you just show a beautiful image and you let it float. And I think that it’s pretty positive.